This year Mamarazzi said lazy to do open house. But then Papa said easy mah...no need to cook la. Already have loads of goodies from Trengganu leh. Got the famous Lemang Kijal, got the Fish Karipap, got the ketupat.....ahem ahem...eh...ni Hari Raya or Chinese New Year leh? Oh well.....masyarakat majmuk, right? Just make steamboat la, Papa said. And fry bihun. 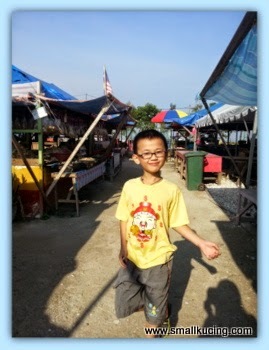 That's why early Saturday morning we headover to Pantai Remis...the one in Jeram...ah...not the other one in Perak. There were loads of fresh seafood being sold there. Crabs, bamboo clams, mussel, clams, lokan, Lala, fish and some unidentified fresh seafood. This is the place to buy cheap and fresh seafood . 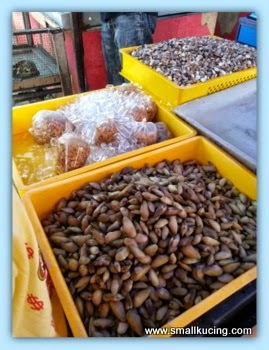 Even have these "Chut Chut" siput. At least that is what we call it la. Dunno the English name. Papa spotted some oysters. Bought some. Came home, Mamarazzi started to chop and clean all the vegetable. Took out the Fishballs and stuffs that we bought from Tj Sepat(that's another story). Heat up the lemang, ketupat and karipap. The lemang and Karipap were great hits among friends coz they had never had fish karipap before. And the lemang taste much better than those found in KL. Cheap too. RM10 for 4 lemang. Where else can you get such cheap lemang? 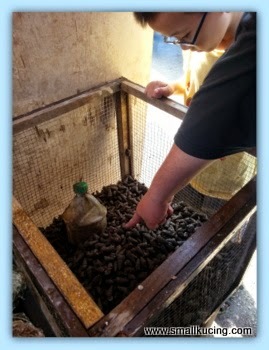 The fresh oysters were not that great. had a hard time opening the oyster....all sort of apparatus were used...including hammer...that is till one of Papa's friend arrived and he used a butter knife to open them. So easy leh. It seems not really fresh. Fresh ones should be white in color. 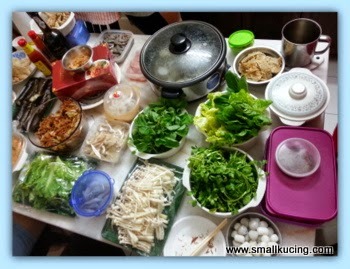 Oh well....just throw into steamboat and cook la instead of eating it raw. 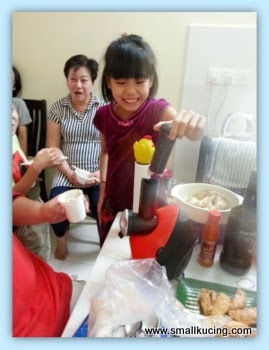 We (the kids) had a great time with the ice cream maker. The night before Mamarazzi freezes some dragon fruits and banana. During the party, we had banana and dragon fruit ice cream. Pure frozen fruit with no sugar added. It was delicious. It seems like not only human, celebrate Chinese New Year. Plants also wanna celebrate. 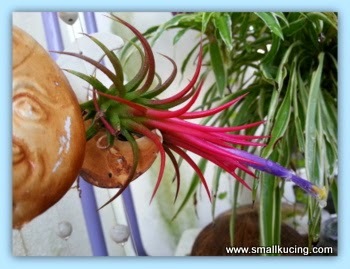 Mamarazzi spotted one of her air plant which previously was green in color had turned rainbow color . It was so lovely. Wah, so nice of Mamarazzi to do an open house party until the plant also want to party by turning colour! So ppretty the colours. I have never seen an air plant turn color like that, it is beautiful!! You have a big celebration and lots of good food! Wah I like open house, very yit lau one.. But after that have to clean and wash and vacuum wor, but nevermind la, mamarazi do only, not you ma, hehe.. Wah the steamboat meal lots of liew wor, all hor liew somemore, I like..
wah CNY open house!! that's a nice thing to have, although I would prefer to be invited than to invite, hehe, not that I don't like but the tidying up and cleaning up is really some nightmare.. unless it's something like the luk-luk van or pot luck thingy, then can consider la.. haha!! eih really lots of seafood there and quite impressive huh?? that's the fun of marketing hor?? 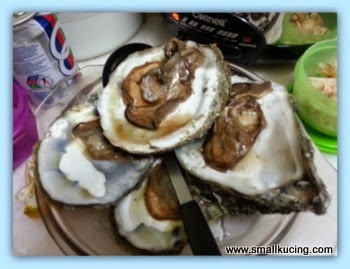 oh the oyster not yet cooked?? I thought Mamarazzi cooked them and they became brown!! yierrr, like that quite funny leh, I thought oysters are white instead?? i don't really like oysters, but i'd be enjoying the ice cream with you! Nice! You get to see and eat many things. The instant frozen fruit ice-cream is such a great idea! Perfect for kids party and healthy too! What a wonderful time together ... with good foods too! So many nice liew for the steam boat. 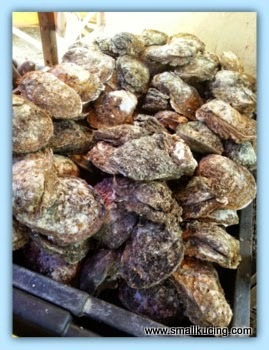 Fresh oysters that you can eat raw quite hard to find. By the time we buy and take home, not fresh liao. Best to eat at the buffet :) I like that air plant, so colourful. Maybe Mamarazzi ong wanna mari. Go and buy lottery ticket! Wow, the air plant looks like it's flowering! What lovely seafood variety you have there! Happy Chap Goh Meh! I like open house but not the work of preparing and cleaning up. That is a very interesting and pretty air plant, very beautiful colour. Very Geng, Mamarazzi...!! Open house some more.. I could never do that... Me close house every time.. But I like to go to people's open house.... Sibu got.. now KL also got.. heheehe..
so when you going to SIbu again ? wow, steam boat! I did once for my staff and it was actually simple. But yours had lots of stuff.. I like your style. Cook what you can and have fun. So a grand open house without me. thrown into steamboat boil eat...no lausai...so ok gua.